BJP president Amit Shah has met party veteran Murli Manohar Joshi on Monday evening and is expected to meet LK Advani later. Shah is meeting the two leaders days after they were not given poll tickets. The BJP has fielded Shah from Gujarat's Gandhinagar, a seat represented by Advani for many years. Joshi has been replaced by Satyadev Pachauri in Kanpur. After being denied ticket, Joshi had issued a statement saying the BJP told him that he would not be nominated by the party in Kanpur. Reacting to it, Mayawati said, "The BJP and the Narendra Modi government, which blatantly betrayed the people and failed to fulfil the election promises, have no moral right to release a new manifesto." What appeared to be a marriage procession, surprised people when they found out that he was Sanyukt Vikas Party's Lok Sabha nominee Vaidh Raj Kishan, on his way to file the nomination papers. "Today is my marriage anniversary, that is why I have become a bridegroom. I have come here to file nomination as a 'damad' of politics," he added. But the 'barat' (procession) was stopped by police at Sadar Bazar area and Kishan had to dismount the horse to reach the collectorate and file his nomination. However, this was not the first gimmick by Kishan. In the 2017 Uttar Pradesh Assembly elections, he had arrived to file his nomination on an 'arthi' (bier). Targeting the BJP leadership over its candidate selection in Rajasthan, chief minister Ashok Gehlot Monday said all the four union ministers contesting Lok Sabha polls in the state are in a "weak position" as the public is "unhappy" with them. Gehlot said Prime Minister Narendra Modi made first-time MPs ministers and people are "fed up" with them in five years. “Prospects of union ministers contesting Lok Sabha polls in Rajasthan are poor. Ticket of one minister, CR Chaudhary, was dropped and rest of the ministers- Gajendra Singh Shekhawat in Jodhpur, PP Chaudhary in Pali, Rajyavardhan Rathore in Jaipur rural and Arjun Ram Meghwal in Bikaner are in a weak position. There is resentment among the public against them,” he claimed while addressing a rally. Several celebrity Congress members like newly-joined Urmila Matondkar and Priya Dutt filed their nominaitons for the Lok Sabha election on Monday. Congress leader Ahmed Patel took to Twitter to note that the BJP leadership had not to address a press conference after the release of their manifesto. TMC leader Derek O'Brien on Monday advised people to "judge" the BJP's manifesto based on certain criteria. National Conference leader Omar Abdullah said referred to Jammu and Kashmir governor Satya Pal Malik's statement that there was no threat to Article 370 in the state. Finance Minister Arun Jaitley said that 90 percent of the speeches made by Opposition leaders were about Prime Minister Narendra Modi. "Take Modi away and 90 percent speeches of the Opposition leaders will be over," he said in an interview with The Indian Express. He also said that the 2019 Lok Sabha election had become a "referendum" on Modi. WATCH: Farooq Andullah vehemently opposes BJP's proposal to remove 370. National Conference (NC) chief Farooq Abdullah said that they would "not allow" the BJP to scrap Article 370. Mamata Banerjee says Narendra Modi 'knows nothing' about family. West Bengal chief minister Mamata Banerjee slammed Prime Minister Narendra Modi in a rally in Cooch Behar. Delhi chief minister Arvind Kejriwal said that BJP had unveiled a "fresh set of jumlas", referring to the ruling party's manifesto. West Bengal chief minister Mamata Banerjee hit out at Narendra Modi after the BJP released its manifesto. "Modi did not have time to look after the farmers and the middle-class, as he was busy touring the globe for 4.5 years of his five-year term." Congress leader Ahmed Patel said,"Our manifesto has a crowd of people, and BJP manifesto has face of just one man." The Vishwa Hindu Parishad reacted to the BJP's manifesto announcement on Monday. The ruling party said that it was "committed" to build the Ram Mandir within the ambit of the Constitution and the law. However, the VHP said that the construction of the Ram Mandir "must begin this year". "Can't expect tukde-tukde gang to build the Ram Mandir," the VHP spokesperson was quoted by CNN-news18 as saying. The Supreme Court on Monday ordered for the VVPAT verification to be raised from one EVM to five EVMs per Assembly segment/parliamentary constituency. The joint rallies Congress president Rahul Gandhi and party general secretary Priyanka Gandhi were scheduled to address in Uttar Pradesh's Saharanpur, Shamli and Bijnor has been cancelled, reports said. The official reason given for the cancellation is bad weather. Randeep Surjewala lists BJP's "lies"
Congress spokesperson Randeep Surjewala claimed that the BJP "lied" in its manifesto about 11 things. Surjewala lists unemployment, demonetisation, GST, among others as the NDA government's failures. "This balloon of lies is going to burst," he said. Congress spokesperson Randeep Surjewala hit out at the BJP over its manifesto for the Lok Sabha election. "We have found 11 lies from the manifesto that the BJP has announced today. Neither of the Union ministers who spoke today mentioned these words: Unemployment, demonetisation, GST, black money or corruption." West Bengal chief minister Mamata Banerjee hit out at the BJP over its manifesto for the Lok Sabha election, which was released on Monday. " We must remove Narendra Modi from his seat and politics. We won't let him implement the Citizenship Amendment Bill," Mamata said. Prime Minister Narendra Modi made a pitch for re-election during the launch of the BJP manifesto. "By 2047, which will be 100 years of independence, it is my dream that India is established as a developed country. The foundation for that dream are the coming five years, the duration between 2019 to 2024," he said. Prime Minister Narendra Modi said the NDA government is committed to "good governance".Modi said, "We have used technology to help benefits and welfare schemes percolate right to the bottom." Prime Minister Narendra Modi said that cleanliness is a "public movement", it cannot be done just by a government. "I want to thank the media and the youth for the success of the Swachch Bharat Abhiyan," Modi said. The prime minister said that the work that had to be done by previous governments, was "left to him to do". He also said that the "success" and experience that the last five years provided have inspired the manifesto for the 2019 election. "We will create a new organisation to ensure that our water resources are used in an optimum way. We will work to ensure all communities are empowered and provide them with sustainable sources of water," Modi said, adding that the water scarcity in states like Tamil Nadu is worrisome. 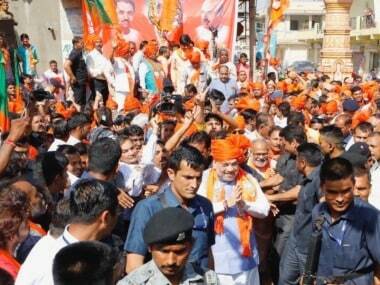 We have strived to make our development policies multi-layered, said Narendra Modi. "We have also tried to bring in a multi-dimensional aspect to our policies, so that they can be dynamic with respect to what the situation demands," the prime minister said. Prime Minister Narendra Modi said, "We have planned out goals that are time-bound and well defined. Nationalism, unity, and security are to be the party's priority for the 2019 election." Prime Minister Narendra Modi begins his address at the BJP's manifesto launch. "The people of the country have helped us bring in development. Thank you for the last five years." BJP leaders and Union ministers like Rajnath Singh, Sushma Swaraj and Arun Jaitley addressed party workers at the BJP manifesto launch on Monday. While a majority of them spoke at length about the NDA government and action taken by the Modi-led government over security, economy, and development, Rajnath and Amit Shah heaped praise over the prime minister for the last five years. In fact, majority of the leaders launching BJP manifesto, spoke little of the future, and rather focussed on what the party (or the NDA alliance) has done in the last 5 years. Finance Minister Arun Jaitley detailed the NDA government's achievement to make India a "strong economy" "What is the government we require for a strong government? Do we require a fragile, failed government? No. We need a strong-majority government," Jaitley said. Finance Minister lists achievements of the NDA government. "We have made significant progress in the aspect of security, in space research. We will act completely with the promise to make India one of the strongest forces internationally." Finance Minister Arun Jaitley says that BJP manifesto is focused on a 'united' India. Rajnath Singh, the head of the drafting committee of the BJP's manifesto, said that more seats would be provided in higher education institutions in fields like medicine, engineering. Home Minister Rajnath Singh said that the Uniform Civil Code and Ram Mandir have been mentioned in the manifesto. "We have our full commitment on Uniform Civil Code," Rajnath Singh said. "There has been a long-standing demand that all elections in the country should be held simultaneously instead of every other month. There should be a debate regarding this, so we have added this in our manifesto," Rajnath Singh said. "Small and marginal farmers above the age of 60 will be given pension," Rajnath Singh says, detailing the content of the BJP's manifesto. "We will also create a national businessperson's organisation. We will also give the small and medium businessmen above the age of 60 a pension." Speaking about the content of the BJP's manifesto, Rajnath Singh said, "Our 'zero tolerance' approach against terrorism finds priority mention in the manifesto. We have also promised that the Citizenship Amendment Bill will be brought in but we will ensure that any state's identity or culture is not harmed." Rajnath Singh detailed how the BJP's manifesto has been written, by consulting lakhs of people via social media. "This manifesto has been written for the people and aims to consider every section of society. I can say Narendra Modi has tried his best to deliver on the promises made in the 2014 manifesto." Home Minister Rajnath Singh, who headed the committee of the BJP's manifesto, said that lakhs of people had been consulted before the manifesto was written. He also detailed the process of how the manifesto was conceived. "We want India to be among the top leaders on an international level. As far as the prime minister is concerned, I can confidently say that the people's trust in him has increased," Singh said. The top BJP leadership of Prime Minister Narendra Modi, chief Amit Shah, and Rajnath Singh released the manifesto for the Lok Sabha election. "It has been dedicated to the people of the country," the party said. BJP president Amit Shah said that all sections of society have been considered for welfare under the ruling party's manifesto for the Lok Sabha election. "This manifesto had been written by Rajnath Singh after consulting at least 6 crore people." Heaping praise on Narendra Modi for the NDA government's achievements, Amit Shah said, "The development and security that India has seen from 2014 to 2019 is all thanks to the Narendra Modi government. The prime minister has taken decisions for the betterment of the country. "The youth are daring to hope for a better future, India is daring to hope for better security under Narendra Modi's leadership." "All the citizens of India are assured of their safety and security due to the decisive anti-terror decisions taken by the Narendra Modi government," Amit Shah said. "In these 5 years, the BJP has worked towards providing a decisive govt, under the leadership of Narendra Modi. We have shown the world that no one can threaten India's security," Shah said. Addressing the gathering, Amit Shah said that under the leadership of Prime Minister Narendra Modi, NDA stormed to power in 2014 and said that the alliance is hopeful of a similar win this year as well. BJP president Amit Shah is addressing the gathering ahead of the announcement of the BJP's manifesto. The launch of the BJP's manifesto for the Lok Sabha election has begun with felicitations for Prime Minister Narendra Modi and BJP president Amit Shah. Union ministers Sushma Swaraj and Rajnath Singh have reached the party headquarters as BJP party president Amit Shah and Prime Minister Narendra Modi are expected to release the manifesto shortly. Ahead of the announcement of the BJP manifesto, Prime Minister Narendra Modi arrived at the party headquarters. Congress leader Jaiveer Shergill on Monday was quoted by ANI as saying, "Instead of launching a 'Sankalp Patra' (manifesto), BJP should launch a 'Maafi Patra' for injecting a lethal injection of unemployment, farmers suicide, closing of businesses and putting youth towards Pakoda employment." The ruling party's manifesto for the Lok Sabha election is expected soon. Independent candidate for the Guwahati Lok Sabha seat, Upamanyu Hazarika, found an empty BJP "office" and occupied it for his own campaigning. "Just like this empty office, the BJP's promises are empty," he was quoted as saying. Ahead of the BJP's announcement of its manifesto for the Lok Sabha election, speculation regarding the content of the poll document is rife. According to reports, "nationalism" and national security, along with welfare measures for farmers and women are likely to be the key aspects of the manifesto. A reiteration of Prime Minister Narendra Modi's 'Sabka saath, sabka vikas' slogan is also expected. The ruling party is also likely to present a track record of the NDA government's five-year tenure, CNN-News18 said. Home Minister Rajnath Singh headed the committee that has written the ruling BJP's manifesto, reports said. The announcement is expected shortly after the party's parliamentary board assembles at the headquarters. Union ministers have arrived at the BJP headquarters in Delhi ahead of the party's announcement of their manifesto for the Lok Sabha election. The release of the 'sankalp patra' is expected soon. The Apna Dal on Modnay named Pakauri Lal Kol as its MP candidate from Robertsganj parliamentary constituency. Rajasthan deputy chief minister Sachin Pilot on Monday slammed the KCR-led TRS government in Telangana and said that it was "doing all it can" to "buy" legislators and "pressurise" lawmakers. "Incumbent government in Telangana is doing all it can to buy legislators and pressurise lawmakers, to create environment of fear like Mr Modi is doing in rest of India by using agencies to quieten voices of anybody who questions BJP. "The minute you ask questions to BJP or the prime minister you are called anti-national. You ask why there is inflation, why farmers are committing suicide, we are told 'Go to Pakistan'. This sort of rhetoric, based on emotions don't serve India's election well," he said. 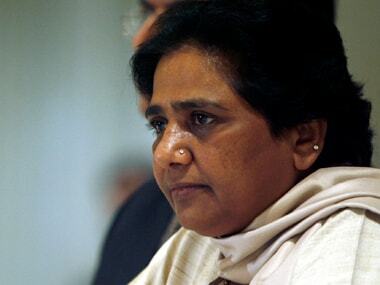 In her rally in Saharanpur's Deoband on Sunday, BSP chief Mayawati attacked Congress' NYAY scheme and said, "If we form a government, we will not just give Rs 6,000 but also provide stable employment to every household." After the first joint rally of the SP-BSP-RLD alliance in Uttar Pradesh on Sunday, BSP chief Mayawati is likely to continue efforts on the campaign trail on Monday. In Sunday's rally, she slammed the Congress and ruling BJP for "anti-poor" and "hollow" policies. Uttar Pradesh chief minister Yogi Adityanath will also address rallies in Uttar Pradesh's Bijnor, Muzaffarnagar, Shamli and Baghpath on Monday. Congress president Rahul Gandhi and party general secretary Priyanka Gandhi will address a joint rally in Uttar Pradesh on Monday. They will address the public in Saharanpur, Shamili and Bijnor districts of the western Uttar Pradesh, where polling is scheduled to take place in the first phase. 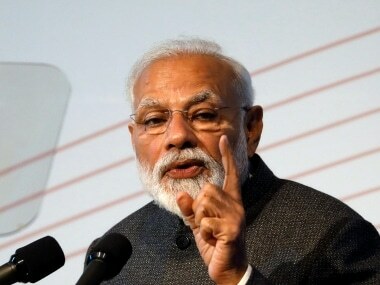 With only a few days to go for the Lok Sabha election, Prime Minister Narendra Modi will address public meetings in Maharashtra's Osmanabad, Karnataka's Chitradurga and Mysore, and Tamil Nadu's Coimbatore. RJD leader Tejashwi Yadav released the parties manifesto for the Lok Sabha election in Bihar on Monday. He said that the plans in the manifesto are intended to uplift the marginalised sections in the society. "RJD has always favoured reservation in private sector. we will ensure it becomes a reality," he said. The Kamal Haasan-led Makkal Needhi Maiam (MNM) released its election manifesto for the 2024 Lok Sabha election. The manifesto is titled 'Kovai 2024'. RJD leader Tejashwii Yadav on Monday released the party's manifesto for the Lok Sabha election. Tejashwi, son of RJD chief Lalu Prasad Yadav was joined by other senior leaders of the party. The ruling BJP will also release its manifesto at 11 am on Monday. The BJP is likely to release its manifesto for the Lok Sabha polls on Monday. Party president Amit Shah is expected to release the 'Sankalp Patra' in the presence of the BJP parliamentary board members, which includes Prime Minister Narendra Modi. With the Congress manifesto putting a major thrust on welfare measures — including a promise of giving Rs 72,000 to the poorest 20 percent households in India — the ruling party is likely to make a slew of promises to woo different sections of the society, especially farmers, youth and women, besides the downtrodden, reports said. Prime Minister Narendra Modi is a "national calamity" who needs to be defeated in the April May Lok Sabha polls to safeguard the nation, NCP chief Sharad Pawar said in Maharashtra’s Amravati on Monday. Pawar also lashed out at Modi for saying that the former had lost grip on the Nationalist Congress Party which was wracked by a "family feud". "I am happy in my home. You (Modi) need not worry. You never had a home in your life," Pawar said. He also lashed out at Modi for not visiting Gandhiji's Sevagram Ashram during his Wardha visit on 1 April. Calling the Prime Minister’s visit a ‘drama’, Pawar said Modi claims to be a Gandhian and gets pictures clicked of himself spinning the charkha but did not deem it fit to pay tribute at Sevagram Ashram. Uttar Pradesh chief minister Yogi Adityanath hit out at BSP chief Mayawati over her appeal to Muslim voters during the SP-BSP-RLD joint rally in Uttar Pradesh on Sunday. BJP president Amit Shah may meet party veterans LK Advani and Murli Manohar Joshi on Monday, days after the party dropped both leaders as its Lok Sabha candidates. The BJP has replaced Advani, who represented Gandhinagar for many years, with Shah as its candidate from the constituency in Gujarat. Joshi has been replaced with Satyadev Pachauri in Kanpur. Joshi issued a statement, saying the party told him it would not nominate him as the BJP candidate from Kanpur. While Advani has not said anything about being dropped from the party's list of Lok Sabha candidates, he wrote a blog asserting his party never regarded those who disagreed with it politically as "anti-national". Shah is likely to meet both leaders on the day the party released its manifesto. 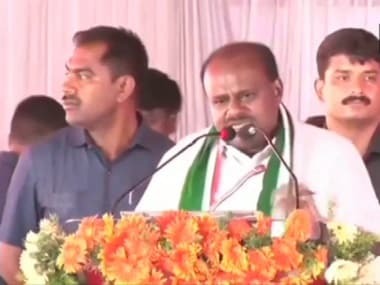 One of the BJP's allies in the NDA government, the JD(U) on Monday expressed a difference in opinion over the ruling party's promises regarding the Uniform Civil Code and Article 370 in its manifesto. The BJP said that it was committed to abrogating Article 370 in the North East and also bring in the Uniform Civil Code. CNN-News18 quoted a JD(U) spokesperson as saying that the party was "ideologically" opposed to the Uniform Civil Code. Nationalist Congress Party (NCP) chief Sharad Pawar said at an Amravati rally that Prime Minister Narendra Modi is a 'natural calamity' and said that his visit to the Sevagram in Wardha was a 'drama'. Narendra Modi says 2019 to 2024 will be the foundation for a bright future. Modi also made a pitch for re-election during the launch of the BJP manifesto. "By 2047, which will be 100 years of independence, it is my dream that India is established as a developed country. The foundation for that dream are the coming five years, the duration between 2019 to 2024," he said. Amit Shah says all Indians are feeling safe under Narendra Modi-govt. "All the citizens of India are assured of their safety and security due to the decisive anti-terror decisions taken by the Narendra Modi government," Amit Shah said. RJD leader Tejashwii Yadav on Monday released the party's manifesto for the Lok Sabha election. Tejashwi, son of RJD chief Lalu Prasad Yadav was joined by other senior leaders of the party. The ruling BJP will also release its manifesto at 11 am on Monday. 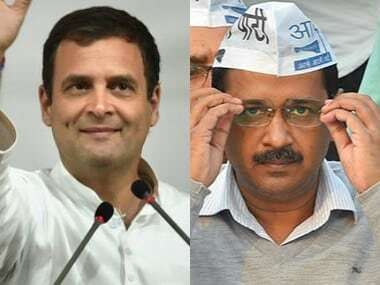 The ruling party and Opposition leaders will also keep up election campaign efforts as there are only a few days to go for the first phase of the Lok Sabha election. Modi is scheduled to address public meetings in Maharashtra's Osmanabad, Karnataka's Chitradurga and Mysore, and Tamil Nadu's Coimbatore. The BJP and Congress released their General Election campaign themes on Sunday. With the tag line "Phir ek bar, Modi sarkar", the BJP on Sunday unveiled its campaign highlights, which included the Modi government's "befitting" reply to terrorism by "hitting terrorists by entering enemy territory". Meanwhile, the Congress said that 'Ab Hoga Nyay' will be its slogan for the polls. The party launched a campaign centered around the theme of 'justice', while alluding to the party's proposed minimum income scheme and the 'anyay' (injustice) "prevailing under the BJP rule".